PACIFIC Pines Power junior product Joel Baxter will not forget his maiden QAFL senior’s appearance for Labrador last weekend. 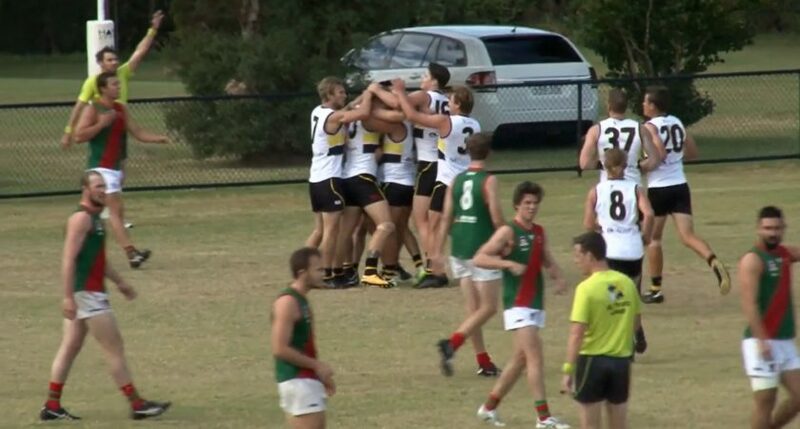 Thrust into Labrador’s top side against Sandgate at Cooke-Murphy Oval to cover for a major injury run, Baxter slotted a goal with his very first kick at QAFL level on his way to four majors before half-time. The Tigers scored by 73 points to snap a losing streak then, to cap off a memorable debut, Baxter was subsequently named Round 8 Rising Star nominee. “I guess it was an ideal debut in senior grade,” the 19-year-old Baxter told aflq.com.au. Baxter was last year’s Labrador Colts captain when he kicked 31 goals for the season as a forward and midfielder. But he never got a crack at senior grade at a club that had won flags in 2015 and 2016 and finished runners-up in 2017. “It was probably just my fitness levels really, trying to get up to the standards needed for senior footy,” Baxter said. “My coach Aaron Shattock told me to work on a few things but the big one was on game fitness, being able to keep up with the speed and being able to run out the game. When the name of Baxter appeared at full-forward in Saturday’s selected team it caused some confusion in certain areas because one Josh Baxter, also a forward, played for the Tigers in the 2015/16 premiership victories. Baxter (Joel) is now back with Southport in the NEAFL. After his four first-half goals, young Joel did not kick another after Sandgate dropped players back to the defensive zone. “I played a bit of a different role in the second half, kind of isolated one-on-one then I was moved up the ground later on,” Joel explained. He was also called on for some help in the forward-line ruck duels. Baxter played for Pacific Pines through his U8-U14 days then switched to Labrador as an under-14. He played for the old Coast Coast Stingrays age-team and also represented the South Coast schools team.